The historian and ecologist Oliver Rackham (1939-2015) asserted that ‘woodland by its very nature can be understood only in terms of historical processes’. In a Welsh context, the understanding of these historical perspectives is not as advanced as it could be, and remains heavily dependent on William Linnard’s seminal work on Welsh Woodlands and Forests: History and Utilization (1982). Prior to the 20th century the overwhelming majority of woodlands and trees in Wales were located on lands belonging to landed estates. 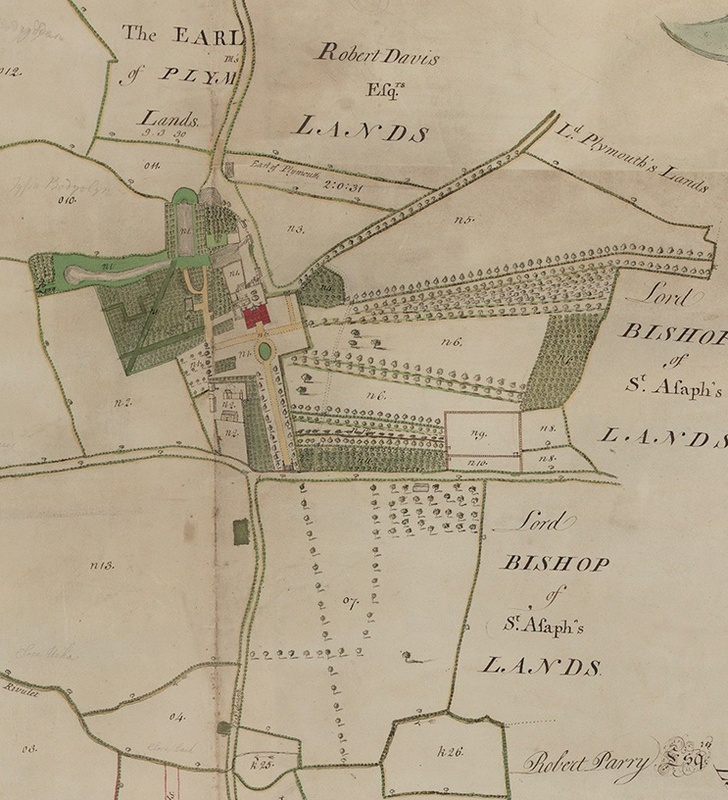 A map of the Bodrhyddan demesne in Flintshire, included in an estate atlas of 1756, gives some indication of the primacy of trees and woodlands in estate landscapes. Here, trees constitute a key aspect in the gardens immediately surrounding Bodrhyddan; they are seen lining the main driveway to the house and other paths and avenues; large standalone trees (probably oaks) feature in the parkland; there are small areas of woodland and wood pasture; there are indications of trees demarcating old field boundaries; and they feature as part of the hedgerows. Since medieval times, woodlands formed important features in elite recreational landscapes; medieval ‘forests’ were inextricably linked to hunting. Later on, trees and woodlands often played essential roles in the creation of ‘designed’ landscapes, with emphases on the picturesque and sublime. This is clearly suggested in John Davenport’s 1791 plan of intended improvements at Nanteos, the Cardiganshire seat of Thomas Powell. The plan was never implemented, but shows the sites and species of trees which were to be planted or retained to create the desired landscape aesthetic. On many estates, individual trees could be vested with significant symbolic weight. The Ceubren yr Ellyll, a large hollow oak on the Nannau estate in Merionethshire, provided the vessel for a legend which was at the heart of the Vaughan family’s identity. This was held to be the resting place of the skeleton and spirit of Hywel Sele (ancestor to the Vaughans) who was slain by Glynd?r after an act of treachery. After the old oak fell down in 1813, the timber was used to create a range of family heirlooms for the Vaughans, including a set of six acorn-shaped toasting cups, which symbolised important links with ancestry and land: a deep-rootedness in the locality. There are numerous examples of this type. It is indicative that in his 1774 map of the Bachymbyd estate in Denbighshire, Meredith Hughes ensured that the three sweet chestnuts known as ‘The Three Sisters’ were depicted in the grounds below Bachymbyd. According to a family legend, the trees were planted in the late-17th century by three sisters of the Salesbury family in recognition of their mutual love and affection. As with the Nannau Oak, it is an example of the owners of the estate affixing parts of their identity to trees within their landholdings. In addition to their aesthetic and cultural significance, trees and woodlands played important economic roles in the functioning of estates. From an early period they were often subject to intensive management, largely through pollarding and coppicing – to provide a huge range of products, fuel and food – ranging from charcoal, to architectural timbers, acorns for animal fodder and bark for tanning. Woodlands could form valuable economic assets for estates and were often fiercely protected by landlords and their agents. Their economic significance is evidenced by the decision of some families to commission maps dedicated to woodlands in their ownership. 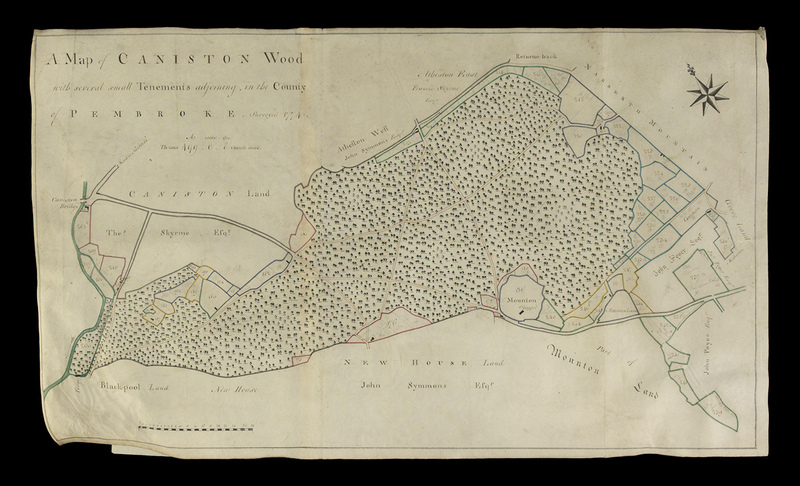 A good example is the 1774 map of Canaston Wood, associated with the Slebech estate in Pembrokeshire. Particularly from the 19th century, forestry became a big part of the business of some estates, signalled by huge schemes of afforestation, the employment of increasingly professionalised foresters (especially from Scotland) and the establishment of large estate sawmills. 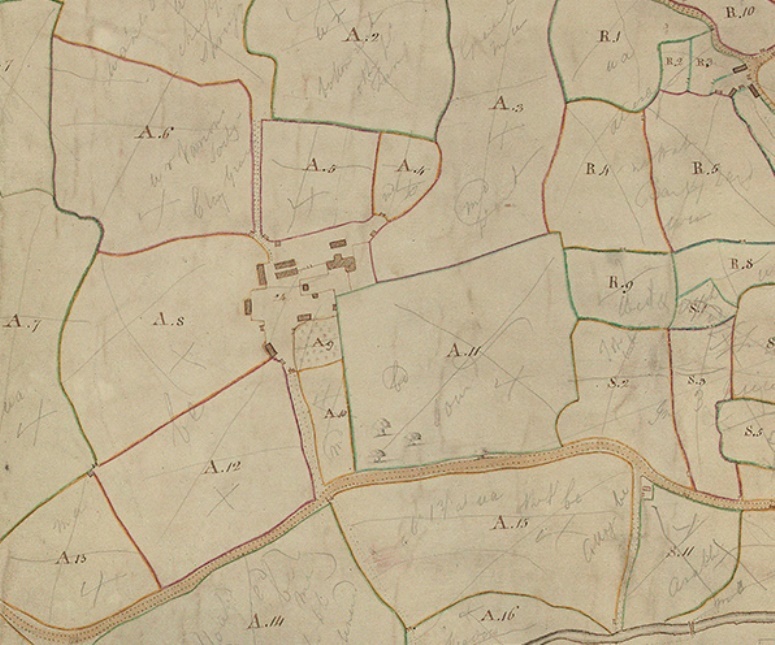 Estate records, including estate maps, potentially have a crucial role to play in enhancing understanding the ‘historical processes’ underpinning the Wales’ woodland assets. At the Institute for the Study of Welsh Estates at Bangor University, we are beginning to explore some of the research opportunities linking ecology, history, forestry, land management and archives – connecting research to policy and practice. Earlier this year we partnered with Bangor’s Forestry Students Association (BFSA) and the Woodland Heritage charity to organise an event focused on the Past, Present and Future of Woodland Management; in essence, how can an enhanced understanding of the historical framework of woodland management on Welsh estates be used to promote principals of sustainable woodland management in 21st century Wales? One important way that estate maps might be able to contribute to this agenda relates to the Ancient Woodland Inventory (AWI), managed by Natural Resources Wales. This dataset identifies areas in Wales that have had continuous woodland cover since c.1600, thereby producing ecosystems which tend to be more ecologically diverse, culturally significant and worthy of protection. Thus far the AWI in Wales has been primarily based on the woodlands marked on 19th century OS Maps. There would appear to be real opportunities for exploring how earlier estate maps (and related estate records) can be used to enhance the accuracy, coverage, depth and detail of the AWI, including the identification of changing woodland boundaries over time and the marking of ‘veteran’ trees. 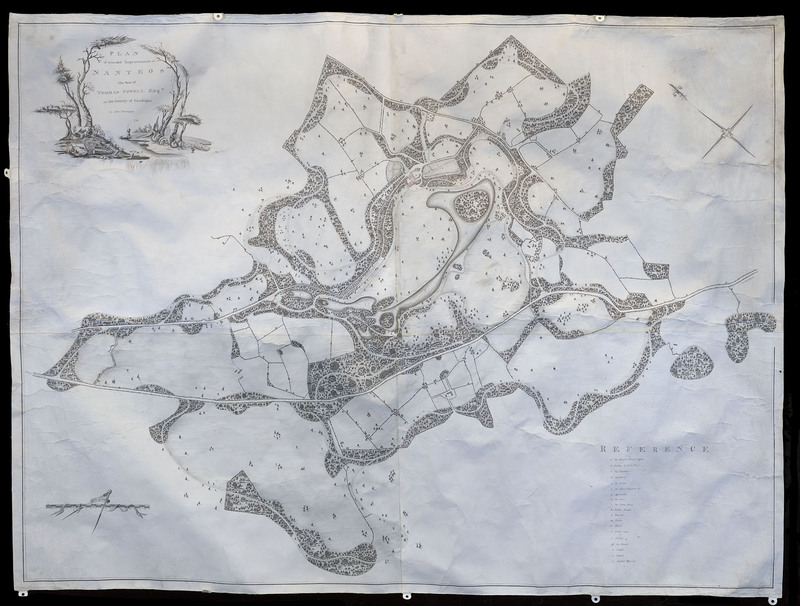 This is just one of the ways in which old estate maps can be employed as a useful resource for Wales’ land futures.